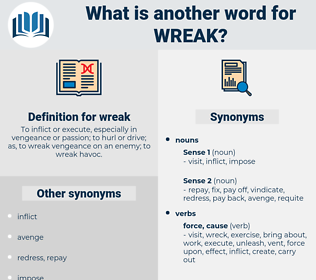 What is another word for wreak? To inflict or execute, especially in vengeance or passion; to hurl or drive; as, to wreak vengeance on an enemy; to wreak havoc. inflict, generate, create, engender, destroy, induce, lead, result, spark. cause, sow, trigger, provoke, spread, outrun, pose. fail, neglect, destroy, ignore, forget. 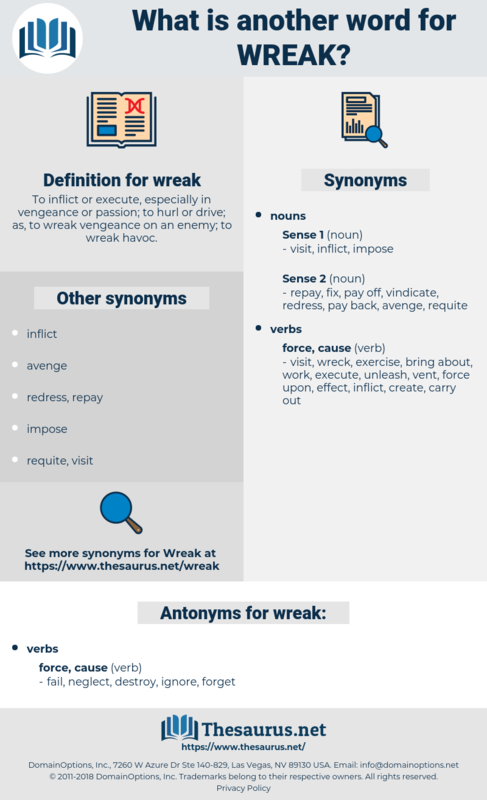 But its weaknesses, which it is vain to disguise, are also explained by the author's personal bias - the desire to wreak vengeance upon an enemy. They hold priceless treasures and allow thieves to enter and wreak their will. riecke, rieke, reeck, reick, rieck, riek, reek.